Good day. In this programme I want to tell you about the Holy Spirit of the living God. Look at the pictures in the purple book while you listen to this. Turn to the next picture when you hear this music. Look at the picture. The Lord Jesus is rising from earth up to heaven in a cloud. His disciples (close followers) are watching intently. Jesus is truly God and He came from heaven to earth nearly 2 000 years ago. He was born to a virgin named Mary in a town called Bethlehem. Jesus became man to show what God is like. All people have displeased God by their wicked ways. They have sinned. The punishment of sin is death and separation from God. But God loves all people. He does not want them to go to hell, the place of punishment. So Jesus came to take the punishment for our sins. That punishment is death. Wicked men killed Jesus by nailing Him to a wooden cross. Many people saw how He died on that cross, but many of his disciples and followers also saw Him after He rose from the dead. It was then when He told them, " . . . you will receive power when the Holy Spirit comes on you; and you will be my witnesses in Jerusalem, and in all Judea and Samaria, and to the ends of the earth." 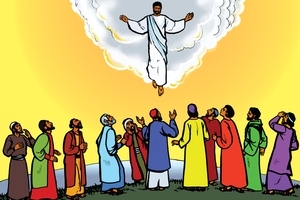 After He had given them this command, Jesus went up in a cloud as you see in this picture. One day He will return to earth in the same way to judge all the people of the earth. All people who hear the good news of Jesus, believe in Him and obey Him, have the gift of God's eternal life. Immediately after Jesus went up to heaven, his disciples agreed to gather in a house to pray. Then God's Holy Spirit came to them as Jesus had promised. Suddenly there was a noise from the sky, like a great wind. The people saw something like tongues of fire. The tongues of fire split up into many tongues of flame that rested on each believer. They were filled with the Holy Spirit of God and began to speak about the wonderful works of God in other languages. Jesus always does as He promises; He has sent his Holy Spirit to all people who obey and believe in Him. God's Holy Spirit came to the disciples in the city of Jerusalem in the land of the Jews. At that time there were many Jews in Jerusalem, from many different countries. They spoke many different languages. 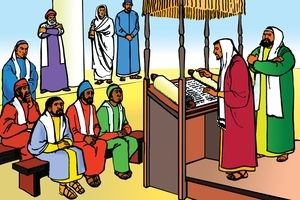 The Holy Spirit helped Jesus' disciples to speak all these languages so that the people could hear and understand the message about the Lord Jesus in their own mother tongue. But some people thought that Jesus' followers were drunk with wine. So one of the apostles called Peter, stood up with the other eleven apostles. He spoke to the crowd and said, "These men are not drunk, as you suppose (think)." Peter shared with them the good news of Jesus. Many people believed Peter's words. They were baptised as a sign of cleansing from sin. They also received the Holy Spirit and they began to follow the way of Jesus. That day many people in Jerusalem trusted in Jesus and became his followers. These people who received God's Holy Spirit often came together like a big family and that was the beginning of the Christian church. Later these people were called Christians. They shared their possessions with each other and they cared for one another. Each day they went to the big temple of God in Jerusalem. There they prayed and praised God together. The disciples, who became apostles, taught them from God's Word. 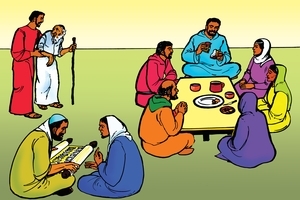 The Christians also came together in their homes, where they shared their food. At regular times they broke bread and drank wine during a special meal called the Lord's Supper. Jesus had commanded his disciples to do it in this way. The night before He was crucified, He had a meal with his disciples and when He had given thanks, He took some bread, broke it and gave pieces to his disciples. The bread was a sign that Jesus' body was to be broken for them on the cross. Likewise Jesus also took a cup of wine and gave it to his disciples to drink. The drink was to remind them of his blood that was to be shed for them on the cross. Jesus commanded his disciples to do this in remembrance of Him. One day Peter and John went to the temple of God to pray. A beggar sat at the entrance. He had been crippled from birth and could not walk. He asked Peter and John for money. Peter said to him, "Silver or gold I do not have, but what I have I give you. In the Name of Jesus Christ of Nazareth, walk!" Peter took the man by his right hand and helped him to get up. At once the man's feet and ankles became strong. 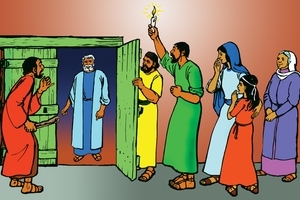 He went into God's temple with Peter and John. He was walking and leaping and praising God. It was not Peter who healed the man. Faith in Jesus and the power of God's Holy Spirit healed him. He had received a gift much better than money. 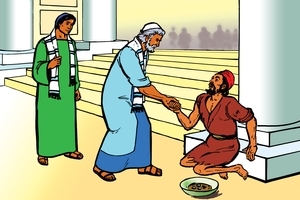 A man called Barnabas sold his land and gave the money to the church to help the poor. A husband and wife, named Ananias and Sapphira, decided to do the same. 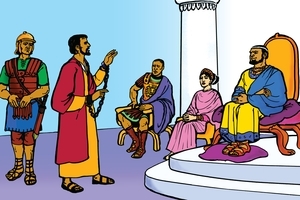 But Ananias kept some of the money for himself and his wife. He brought only part of the money to Peter. Then he lied to Peter, telling him it was the full amount. Peter knew that he had lied, so he said to Ananias, "Ananias, how is it that Satan has so filled your heart that you have lied to the Holy Spirit and have kept for yourself some of the money you received from the land? . . . You have not lied to men but to God." Immediately Ananias fell down dead. Some young men carried him out and buried him. Soon Sapphira came in. She did not know what had happened to Ananias. Sapphira also lied to Peter about the money. So Peter said to her, "How could you agree to test the Spirit of the Lord? Look! The feet of the men who buried your husband are at the door, and they will carry you out also." At once she fell down at Peter's feet and died. We should give to those in need but we should not lie to God or anyone else. God knows the good and the bad thoughts in all of us. Look! 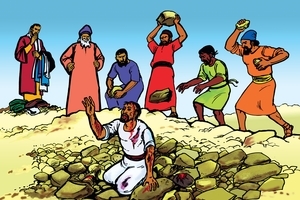 A group of people are stoning a man named Stephen. He served as a leader in the church, helping the poor people in Jerusalem. He taught God's Word boldly and worked miracles by the power of the Holy Spirit. But some Jews opposed him. They took Stephen to court and falsely accused him of insulting God and speaking against his Word. But Stephen was not afraid, because God gave him power through his Holy Spirit. Stephen told those Jews that they had murdered Jesus who had come to give people everlasting life. The Jews became so angry that they dragged Stephen outside the city and started throwing stones at him. While they were stoning him, he prayed, "Lord Jesus, receive my spirit." As he died, he cried out, "Lord, do not hold this sin against them." The men who had stoned Stephen, laid their clothes at the feet of a young Jewish leader named Saul. He approved of Stephen's death. Even today people who want to honour and serve Jesus, are persecuted by evil people. But God and his Holy Spirit will never leave them, even if men should kill them. That day Saul and the other enemies of the Christian church really began to persecute the believers in Jerusalem. Many had to flee from the city. A man named Philip went to the city of Samaria. There he told many people the good news about Jesus and many believed. Then, through an angel, God told Philip to go to the desert road that went from Jerusalem to Gaza. Philip obeyed God. In this picture we see a very important man from the land of Ethiopia. 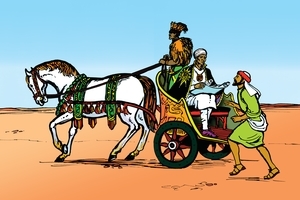 He was travelling in his chariot. He was reading in God's Word about someone who would suffer unjustly, but the Ethiopian could not understand this reading. The Spirit of God told Philip to go to that chariot. Philip ran to it and heard the man read. He then started to explain to the Ethiopian about the Lord Jesus whom God had sent. 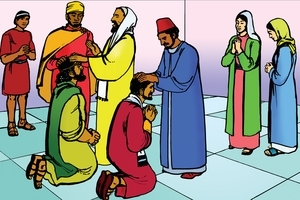 The Ethiopian also wanted to follow Jesus. As they travelled together he said to Philip, "Look, here is water. Why shouldn't I be baptised?" Philip baptised the Ethiopian who went back to his country with great joy. Philip went on to preach the good news in many towns. Like Philip, we must obey and tell others about Jesus, so that they can put their trust in Him and have everlasting life. One day Peter went up on the roof of the house to pray. There he became hungry and wanted something to eat. At that time he saw a strange vision, sent from God. He saw a large sheet coming from heaven with all kinds of animals in it. A voice said to Peter, "Get up, Peter. Kill and eat." 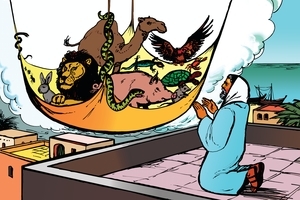 Peter was a Jew and the Jewish law said that the animals that he saw there were unclean and should not be eaten. So Peter answered, "Surely not, Lord! I have never eaten anything impure or unclean." Then the voice said, "Do not call anything impure that God has made clean." This happened three times and then the sheet was taken back into heaven. 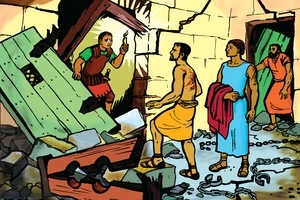 While Peter was wondering what this vision meant, three men came to the house looking for him. The three men came from another town and were sent by a man named Cornelius. Cornelius was a leader in the Roman army. He wanted to honour and serve God. An angel of God had appeared to him and had told him to go and find Peter. Jews considered the Romans to be unclean, but God showed Peter in the vision that he should not call any man impure. God accepts people from every nation who fear Him and do what is right. Peter went with the men to the house of this Roman soldier. When Cornelius saw Peter, he fell down at Peter's feet and worshipped him, but Peter said, "Stand up . . . I am only a man myself . . . May I ask why you sent for me?" Cornelius told Peter about the angel. Then Peter told Cornelius about Jesus who reveals God to people. Cornelius and his family believed in Jesus, they received the Holy Spirit of God and became God's servants. God loves all people, whatever their language, tribe or skin colour. Jesus did not come to save only the Jewish people. He wants to give everlasting life to all people. He wants all nations to trust in Him and serve Him. The king of the Jews, Herod, then began to persecute the followers of Jesus, the Christian church. He had the apostle James killed, and sent Peter to prison. One night Peter, bound with two chains, was sleeping between guards. Suddenly an angel woke Peter up and said, "Quick, get up!" At once the chains fell off Peter's wrists. He followed the angel out of the prison. The iron gate of the prison opened by itself and no one stopped them. Peter thought it was all a dream, until he reached the street outside and the angel disappeared. As soon as Peter got out of the prison he went straight to the house of Mary, the mother of one of the apostles. Many of the believers were there that night, praying for Peter. Peter knocked at the outer entrance (door) and a servant girl named Rhoda went to open it. 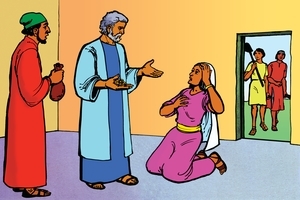 When she heard Peter's voice, she did not open the gate but she ran to tell the others, "Peter is at the door!" They did not believe her and said to her, "You're out of your mind." But Peter kept knocking. When they opened the door and saw him standing there, they were amazed. 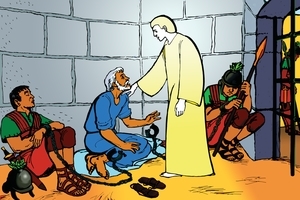 Peter told them how God had answered their prayers by setting him free from prison. In the next few pictures I will tell you about a man named Saul, the man who was present at Stephen's death. Then Saul decided to go to a city called Damascus. He wanted to seize (take) the believers (to prison) there. On the journey an amazing thing happened. A great light flashed from heaven and Saul fell to the ground. A voice spoke to him saying, "Saul, Saul why do you persecute me?" Saul asked, "Who are you, Lord?" The voice said, "I am Jesus, whom you are persecuting, ..." The men with Saul also heard the voice, but saw nothing. Saul got up, but he was blind. The men had to lead him by the hand into the city of Damascus. 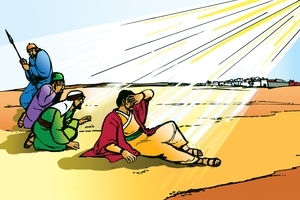 For three days Saul was blind. He did not eat or drink. Yes, Saul had been very cruel to the followers of Jesus. But God is able to change anyone. Here we see a blind Saul in a house in Damascus. God sent a man named Ananias to him. 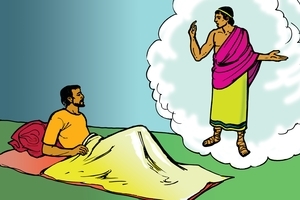 Ananias was a believer and a follower of Jesus Christ. He knew that Saul had done terrible things to the believers in Jerusalem. Ananias, however, obeyed God and went to Saul. 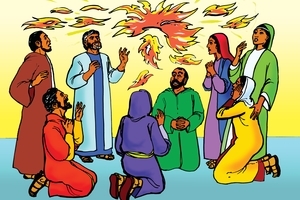 Ananias said to Saul, "Brother Saul; the Lord - Jesus, who appeared to you on the road as you were coming here - has sent me so that you may see again and be filled with the Holy Spirit." 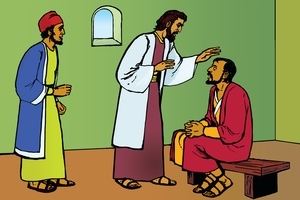 Ananias laid his hands on Saul and Saul's blindness left him immediately. He received the Holy Spirit from God and was baptised to show the people that he was now a follower of Jesus. Then Saul went to the Jews and told them about Jesus. Like Ananias we must obey God and not be afraid of men. Then God will use us to tell others how to be saved. In the town called Antioch, a group of believers came together to worship God. This group of people were the church at Antioch. They were called Christians. 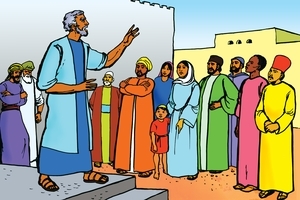 Saul went with Barnabas to teach the people there. One day the leaders of the church fasted and prayed together. 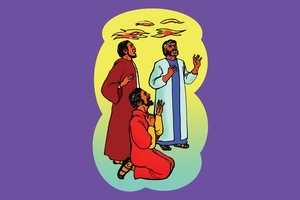 The Holy Spirit spoke to them saying, "Set apart for me Barnabas and Saul for the work to which I have called them." God wanted Saul and Barnabas to go to people who had never heard about Jesus. You can see Saul and Barnabas kneeling in this picture. The church leaders placed their hands on them and prayed for them. 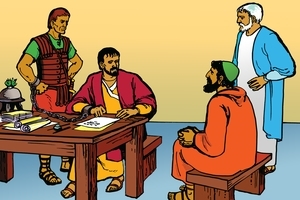 Then they sent Saul and Barnabas to teach the good news of Jesus in places far away from Antioch. Saul and Barnabas went to many towns and villages in distant places. It was at this time that Saul was called by his new name, Paul. They met with the people in the Jewish prayer houses, as you see here. They taught them and said, "The God of the people of Israel chose our fathers and made them a great nation. He gave them great prophets, leaders and teachers. They spoke of the One who would come to save them from sin. He is the Lord Jesus. When Jesus came, many of the Jews did not believe in Him. They did not understand who He was and they would not worship Him whom God had sent." Paul and Barnabas also taught the people that although Jesus did no wrong, He was killed. But God raised Him from the dead. He will never die again. Everyone who puts his or her trust in Jesus, is accepted by God, and his or her relationship with God is made right. But those who doubt and laugh at the truth of God, will be punished by God. Some of the Jews and many people of the other nations believed this message, and more churches were formed, but others would not believe. People will not always believe us when we tell them about Jesus. But God wants everyone to hear and to believe the good news about Jesus and to be saved. Some years later Paul visited these churches again. He took a few men with him, including a man named Silas. They wanted to go to the country of Bithynia, but the Spirit of Jesus did not allow them to go. That night Paul had a vision. In the vision he saw a man from the country of Macedonia who said to him, "Come over to Macedonia and help us." Immediately Paul knew that God had called him to go to Macedonia. God will guide those who want to follow Jesus. Sometimes He guides by dreams or visions, but usually God directs us through the words in his book, the Bible, and through the work of the Holy Spirit in our hearts. Believers must ask God to guide them in all they do. They must trust Him to show them how to obey Him. Paul and Silas obeyed God and went to Philippi in Macedonia. There they taught the people about Jesus. In the Name of Jesus they cast an evil spirit out of a girl. This made some of the people angry and Paul and Silas were beaten and thrown into prison. At midnight they were praying and singing praises to God in the prison cell. Suddenly there was a great earthquake. The doors opened and the chains of all the prisoners came loose. The jailer thought that all the prisoners had escaped. He was so frightened that he decided to kill himself. Then Paul called him, "Don't harm yourself! We are all here!" The jailer then brought Paul and Silas out and asked, "Sirs, what must I do to be saved?" They replied, "Believe in the Lord Jesus, and you will be saved - you and your household." The jailer and his household put their trust in the Lord Jesus and they had great joy. The jailer cared for Paul and Silas and the next morning they were released. They walked away as free men. When times are difficult we should still praise God. When we trust in Him and obey his Word, we can serve Him wherever we are. In this picture Paul is looking at an altar. The writing on it means 'to an unknown god.' The altar stood in the city of Athens. 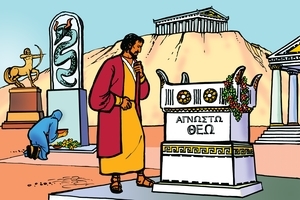 There were many idols, because the people of Athens worshipped many different gods. (When people make something and they worship it, then that is their idol). They did not know the true and living God. The men of Athens wanted to know what Paul was teaching, so he said to them, "Men of Athens! I see that in every way you are very religious. For as I walked around and looked carefully at your objects of worship, I even found an altar with this inscription: TO AN UNKNOWN GOD. Now what you worship as something unknown I am going to proclaim to you. (Now I want to tell you about this God, the One you do not know.)" Paul told them about the true God who made everything. He is the Lord of heaven and earth. He does not stay in temples built by human hands. Paul told them that they could get to know God in the Lord Jesus, whom God raised from the dead. Some men laughed at Paul, but others wanted to learn more about Jesus Christ and some came to believe in Him. Jesus Christ is the only saviour. There is no other god or religion that can save people from their sins (Acts 4:12). Let us be like Paul and trust in the Lord Jesus. If we trust in Him, we should not be afraid to tell other people about Him, so that they may also serve Him. Then they can also prepare for his coming to earth when He will judge all people. As you can see in this picture, Paul is in trouble. He is in the city of Corinth. There were many wicked people in that town. The Jews in Corinth also apposed Paul, because he told them that Jesus was the Christ (Messiah). One night the Lord spoke to Paul saying, "Do not be afraid; keep on speaking, do not be silent. For I am with you, and no one is going to attack and harm you, because I have many people in this city." So Paul stayed in Corinth where he taught the people, and many believed his message. But the Jews who opposed him were jealous. One day they attacked Paul and took him to court. They accused him of teaching wrong things. However, the governor would not listen to them and threw them all out of court. Outside the court these angry Jews beat a Jewish leader who also believed in Jesus. But Paul escaped unharmed and continued to tell about Jesus, in spite of the opposition he had to face. Paul returned to visit the newly established churches. He encouraged the believers to keep on following Jesus. 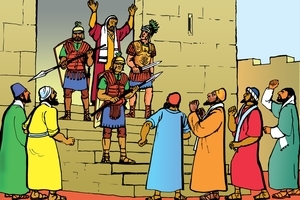 Some believers begged Paul not to go to Jerusalem again. They knew that many of his enemies were there and that they wanted to kill him. But Paul said, "I am ready not only to be bound, but also to die in Jerusalem for the name of the Lord Jesus." When he arrived in Jerusalem, the Jews stirred up the people against him. The mob tried to kill him in the street. 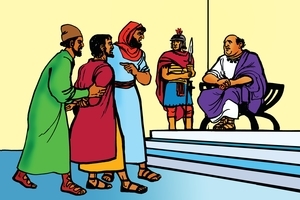 Some Roman soldiers took Paul away from the angry crowd. Paul went and stood on the steps outside the soldiers' barracks. He spoke to the people. But they began to scream, "Kill Him! He's not fit to live!" The soldiers had to take Paul into the prison to save him from the people. Paul was not afraid to die. He knew a great reward is waiting in heaven for all who suffer for Jesus' sake. There in Jerusalem the Lord appeared to Paul and said, "Take courage! As you have testified about me in Jerusalem, so you must also testify in Rome." The Jewish leaders accused Paul before the Roman governor and he sent Paul to Agrippa the king of the Jews. Paul was afraid of no one. He told the governor, the king and the queen about Jesus. He told them how Jesus had appeared to him on the road to Damascus and how Jesus had sent him to tell the good news to people everywhere. King Agrippa was almost persuaded to believe in Jesus. He knew that Paul had done nothing wrong. 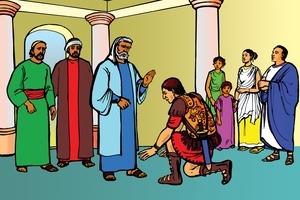 Paul appealed to the emperor in Rome. He wanted to be judged by the emperor's court there. Agrippa allowed Paul to go. Rome was the biggest city in the world then and the emperor, the most important ruler, lived there. God had a special plan for Paul. Soldiers took Paul to Rome with other prisoners. 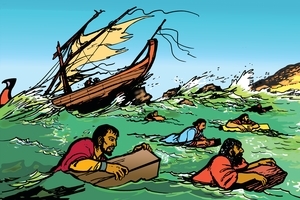 They had to travel in a small ship across the sea. For fourteen days the ship was caught in a terrible storm. The people on the ship thought they were going to die. An angel of God spoke to Paul, "Do not be afraid, Paul. You must stand trial before Caesar (the emperor); and God has graciously given you (saved) the lives of all who sail with you." Soon the ship came near land and began to break up in the shallow waters. The people jumped into the sea. Some were able to swim, some held on to the pieces of the ship. They all landed safely. From this we learn that when God has a task for us to do, He is strong to deliver us from all danger. Here we see Paul in Rome. He remained a prisoner there for two years. He was allowed to stay in his own rented house with a Roman soldier to guard him. He welcomed all who came to visit him. He taught them about the kingdom of God and the Lord Jesus. Paul also wrote letters to the churches he had visited before he was arrested, to teach them further. These letters are in the Bible for all people to learn God's ways. Paul suffered much for the sake of Jesus (and the gospel). He was often beaten and stoned, hungry and homeless. Finally he was put to death by the Romans. But in an earlier letter to the Roman believers he wrote, " . . . I am convinced that neither death nor life, neither angels nor demons, neither the present nor the future, nor any powers, neither height nor depth, nor anything else in all creation, will be able to separate us from the love of God that is in Christ Jesus our Lord." God gives power to all who believe in and serve Jesus Christ. Let us give our lives to Him. Let us serve Him and spread his message so that the whole world can know that Jesus ensures (gives) everlasting life with God. See different versions of this script in Afrikaans, Buhutu, Chinese Simplified, English, French, Herero, Indonesian, Kimwani: Ibo, Lomwe: Mozambique, Malagasy Merina, Ngonde, Northern Sotho, Obo Manobo, Pijin: Solomon Islands, Portuguese: Brazil, Portuguese: Mozambique, Russian, Sena: Mozambique, Shimaore, Shona, Spanish, Swahili: Tanzania, Takwane, Tok Pisin: PNG, Tonga: Malawi, Tsonga, Umbundu, Urdu, Venda, Xirima, Yao: Malawi, Zulu.